4. What Is Six Sigma? I have previously reviewed this book, but have recently read it again, and am reassessing my opinions on it. While I still hold most of my earlier opinions, I have a couple of other insights after the second reading. First, the PowerPoint slides on the included CD are very useful, and are generally well done, but they do contain a number of errors, which should have definitely been caught. Second, the book gets more mathematically oriented as it goes on, and by the time the reader gets to about Chapter 9, the book makes so many assumptions about mathematical background (that may not be safely assumed, even in Business schools) that the example problems and, more importantly, explanations given, are very difficult to grasp: the chapter on forecasting is the peak of indecipherability. Some problems will just say something like 'using calculus...' and then show what happened as a result (this is especially true in the PowerPoint slides, by the way). What I am saying is that people who have recently had advanced calculus and statistics won't have a problem, but anyone who has been away from higher math for a couple of years will struggle. Third, many of the case studies, while very well written and illuminating, are clearly taken from company specific corporate public relations fodder. In other words, they frequently read like propaganda. Don't get me wrong, I very much like the case studies, they just seem a bit stilted, though frequently they are the strongest part of a chapter. Finally, the book is filled with color and expensive printing tricks throughout, like color type, inset boxes, lots of color graphs and charts (some of which are redundant), and the like. My point here is that this stuff, while generally nice to look at is not value added, and dramatically raises the price of the book (mine was $135.00) with no increase in value to the students. For Mr. Chase and the rest of the authors: read your own book. Understand what the consumer (in this case students) want and need, and write that book. Don't fill a book with tons of color and fancy typographical tricks and drive the price through the roof. There are many other Operations Management books available for half the price and I recommended a couple of specific titles in my course critique. The book may look nice, but it isn't worth this price. In summation, I now give this book three stars. It is very comprehensive, and there is a lot of good information between it's covers. If you can grasp the advanced math, put up with the buzzwords, and deal with paying $135 for a single book, this really isn't too bad. 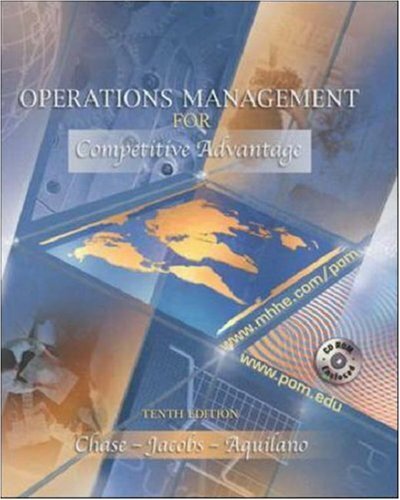 This is an excellent text for a graduate or advanced undergraduate course on operations management. The book is very comprehensive, and in the tenth edition the authors have emphasized recent innovations in e-commerce and the internet. The text is well written, with less obfuscation than most books of this genre. The organization is quite good, with numerous graphs, charts and photos to illustrate the thrust of the subject matter. I particularly like the concept of putting key words in blue type in the margins to easily locate the discussions of a particular subject. The other thing that I really like about this book is the excellent applicable case studies cited as examples in the text. This really helped with comprehension on the material. The CD has some expanded Excel spreadsheets, PowerPoint presentations for the various chapters, and miscellaneous other items of interest. In all candor, I have really not used the CD much, but it is a nice resource to have. Detractors for the book include the degree of statistical background and comprehension that students are presumed to have when they begin using the book, the price of the book (which is driven way up by the lavish full color printing process), and the lack of clarity of some of the illustrations, particularly of the multi-spoke 'activity map' variety. This is a good book, and I would recommend it, especially to a student with a strong mathematical background. I like this book and think it should be in the hands of every manufacturing engineer. Most of the classical manufacturing subjects for example materials technology is treated, but also modern subjects like computer integrated manufacturning systems and automation. As far as I can see it is updated with the latest research and engineering practice. This is one of 2 books that captures the essence of a manufacturing management (or industrial engineering) engineering undergraduate degree- the other being an operations management text from Ray Wild, Nigel Slack, or Laurie Mullins. To help get an idea of what being a manufacturing engineer involves, prospective students should envision a dose of intense team & individual industry-based change projects, and striving globally competitive companies to add "seasoning" to these books. The broad 'technology' contents are useful for industry veterans, consultants, and undergraduate students alike, as well as being a good starting point for researchers. * materials properties- metals, behaviour & testing, properties, alloys, production of steels, non-ferrous production, plastics, ceramics, and composites. * metal casting processes and equipment- fundamentals, processes, and design & economics. *forming and shaping processes and equipment- rolling, forging, extrusion and drawing, sheet-metal forming, powder metallurgy, forming & shaping plastic & composites, forming & shaping ceramics & glass. * material removal processes and machines- cutting, tolls & fluids, round-shape processes, various-shape processes, machine tools and economics, abrasive processes & operations, and non-traditional processes. * joining processes and equipment- oxyfuel & arc & resistance welding, solid-state welding, metallurgy, brazing/soldering & mechanical joining processes. * common aspects of manufacturing- metrology, testing and quality assurance, human factors and safety. * manufacturing in a competitive environment- automation, integrated systems, competition and economics. 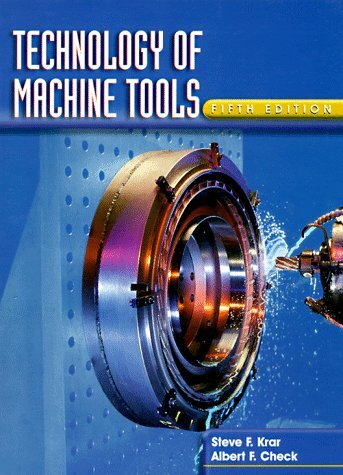 this book contains all the information ever needed by a mechanical production engineer. it is a usful addition to all libararies. Wonderful, in-depth book for Ops Engineers. 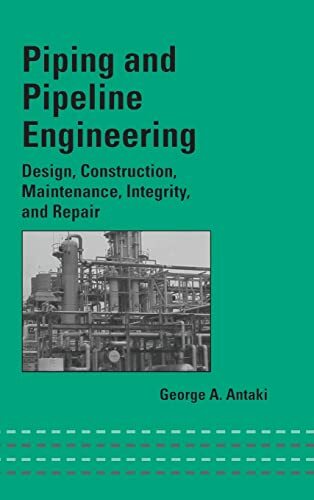 This was a required text for my Production and Mgmt course during my undergrad studies as an Industrial and Ops Engineer at the U of Michigan in 2000. Priot to taking the course, I had very little knowledge of how ops research/optiimization tied in with real world settings. Lucky for me, the course was taught by an wonderful, demanding professor who unfortunately had to leave and now is at the U of Cinnatti. Anyway, I was able to gain tremendous understanding of how statistics, queueing theories, game thoeries, and factory mgmt all got tied into one. It was this book that tied all the pieces together and push me forward toward my career path. I continue to use this book as reference and interesting reads in my continued involvement in the Supply Chain areas and optimization areas in the tech industry. This book WILL build a firm foundation for anyone who gives an effort and has an interest in the subject. What you do with the knowledge, is up to you in the future, since many of these concepts take time and experience to apply in the real world. When science and manufacturing management finally meet !!! This book is a reference in Manufacturing Management. All the basic and complex tools of manufacturing are explained and the historical context of their creation is introduced. More interesting is the global understanding of manufacturing issues and the explanations to go beyond the principles of "zero defect", "zero inventory", ... I learned a lot. As a supply chain consultant, oftentimes the quality of my work is directly impacted by the reference aids in my own personal library. "Factory Physics" is such a reference aid that has my work has benefitted from several times. The book covers all of the traditional manufacturing topics you would expect in sufficient detail: inventory control, JIT, production scheduling, capacity planning, shop floor control, etc. But given that you can buy any number of other suitable, standard P&IC textbooks on these topics, that's not where the value is. The value in "Factory Physics" lies in the unique content which presents manufacturing management in a "scientific" context. For example, there are chapters on 'Basic Factory Dynamics,' 'Variability Basics,' and 'The Corrupting Influence on Variability.' These chapters demonstrate how manufacturing managers and engineers can move away from the rule-of-thumb, heuristics-based approach to operations planning and control (which is so often is either a guessing game or not based on empirical data) to a more formal, rule- and data-driven approach. For example, I have been in many factories where management had only a SWAG approach to modeling equipment reliabilities, cycle times and throughput volumes, which drive queues and thus impact shop floor inventory. This book gives you the tools to properly understand these dynamics, if these are important issues to you. The content in the book on the corrupting influence of variability is a welcome harkening back to the ideas of Edward Deming, who consistently preached about the damage that variation can do when introduced into stable production environments. In my opinion, this is another example of the unique and rare content offered by "Factory Physics." Other value-adding content includes discussions sprinkled throughout the book on the fallacies and disadvantages of age-old planning and control methodologies, such as MRP or EOQ. In a world where 99% of textbooks believe their only duty to the reader is to simply present laundry lists of all the planning techniques known to humankind, these critical commentaries are a breath of fresh air. I don't recommend this book lightly, or to individuals who are only loosely associated with operations planning and control positions. Rather, I highly, highly recommend it to serious, mature manufacturing professionals who are not timid of higher level mathematics, statistics and probability theory. If not, the reader would probably not be able to realize the true value of the book and it would go unused. A former client of mine, who was nice guy but a novice when it came to manufacturing issues, asked me if he should buy "Factory Physics" for his own use. My response to him was this: "If you wanted to learn more about physics you probably wouldn't order reprints of papers by Einstein, Hawking, Bohr, etc. 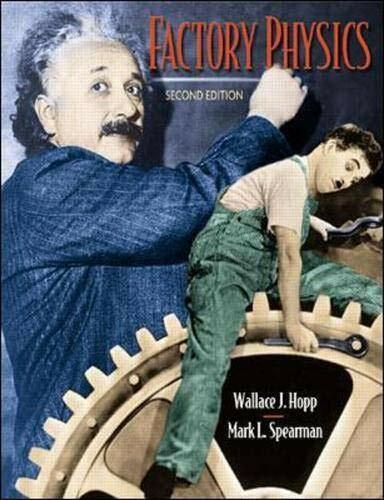 You would go and buy something like 'Physics for Dummies' and start there. I suggest you do the same for manufacturing content." This book is an excellenct introduction for those who just need to 'catch up' with eveyone else talking Six Sigma. It is an easy-read, well-written synopsis of Six Sigma and Six Sigma implementation. It is not an indepth look at statisitcs, SPC or implementation--there are plenty of books out there for that, several by the same author, but it is a very helpful book that I will keep in my library and have already worn the cover by lending it to colleagues. If you are looking for a book to take you from no knowledge of Six Sigma to a very elementary level of knowledge, this could be useful. I found myself feeling like I was reading a company brochure for Six Sigma that was too long. The book falls into a middle ground of not having enough information to be useful in implementing Six Sigma yet might have too much for the average person. 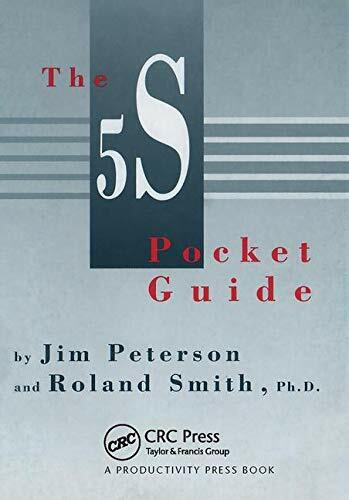 I originally thought this would be a great book to give to people that congratulate me on being a Six Sigma Black Belt, that they once took Karate but never got that far, to understand Six Sigma. After thinking about the level of knowledge of many people regarding basic statistics I think as simple as this book is it may be over the general person's comfort level. I'm afraid it might cause people to shut down from feeling overwhelmed. If they have basic statistical skills, they should have no problem understanding this though. 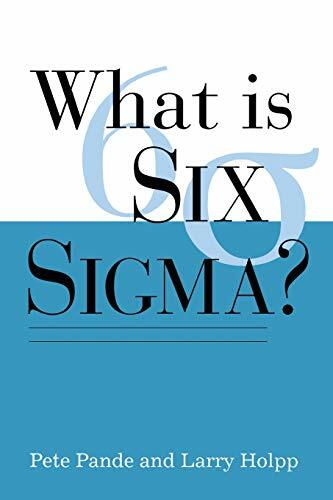 Maybe the book is perfect for people being asked to participate in Six Sigma initiatives or working with a company that is implementing Six Sigma. I would be uncomfortable giving this to somebody with no Six Sigma knowledge and not being available to discuss it with them, hold their hand through it. If you have a real interest in Six Sigma, pick up one of the "heavier" books, including The Six Sigma Way by the same author. You can skim through it and get this same information. If you want more information it will be there, no need to buy another book. This book circulated at my company while decisions were being made as to what management consultant vehicle to pursue. I thought it was quite interesting, and was ready to seek the training, become a black belt and so forth -- but our firm decided to go with Three Rho, because it's twice as efficient for half the price. Such is life. Rho Rho Rho. Of the Six Sigma books I've read, this is the one I'd recommend most highly. It will give you the basic "tools" of Six Sigma in a compact, useable form. I feel that this would be an excellent text for corporate training on Six Sigma, certainly for an introductory course. A quick read of the reviews on Amazon will give you a feel for why people are skeptical of 6 Sigma: the feel-good tone of most writing on 6 Sigma and the insistence that it "is not a flavor-of-the-month management trend" make many of us suspect that 6 Sigma is not much more than hollow jargon and acronyms. Lets accept that these criticisms are valid and further that many "practitioners" are just self-aggrandizing or worse. But that still leaves us with the essential difficulties of positive change in any organization: you need to overcome assumptions that your organization's subculture may not even realize it has. What a corporation does by accepting Six Sigma is that it empowers people to gather data to challenge what "everybody knows". Most importantly, it sets a very high quality standard, which reinforces the sanctioning of data-driven change. The authors of "What is Six Sigma" put it very well early on: "proactive management means making habits out of what are, too often, neglected business practices: defining ambitious goals and reviewing them frequently, setting clear priorities, focusing on problem prevention rather than firefighting, and questioning why we do things instead of blindly defending them." I feel that the greatest flaw in Six Sigma is that many practitioners and even the books permit the basics to be lost in the shuffle. If one listens to people talk about Six Sigma, its easy to forget that a critical part of Six Sigma is that the data comes first, not the solution. I often hear co-workers say "we need to finish this project to improve our six sigmas" or "if we could get rid of this server we'll all get our green belts". The term Six Sigma is derived from statistics and many books gloss over the statistics and move right on to basic project management techniques or how to overcome objections to Six Sigma. This book gives a clear and brief explanation of how to calculate standard deviations and includes a handy table to help with determine "sigma levels". Every Six Sigma book should respond to the challenge raised by this book and also include this information in the first 10 pages. 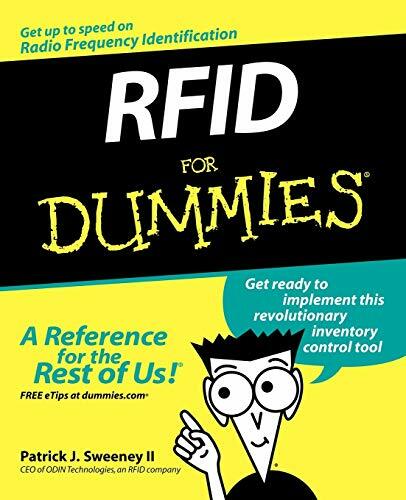 Finally, I recommend this book because it is concise and to-the-point. I feel that the fluff and/or Machiavellian advice in many of the other books just feed into people's healthy skepticism and distract people from the beauty of Six Sigma: the challenge to strive for near-perfect quality and the sanction to use statistics to cut through the inertia in our work lives. I would also recommend Michael Lewis' "Moneyball" (ISBN 0393057658) as a companion book. Lewis (author of "Liar's Poker") uses Wall Street trading as an analogy to explain why the Oakland As baseball team is one of the successful teams with much less money than most. But I also see an analogy relevant to the topic of Six Sigma. "Moneyball" shows how one can achieve superior results by testing what everyone thinks they know with fact gathering and rigorous analyses. Moneyball and "What is Six Sigma" may prove to be an inspiring combination. 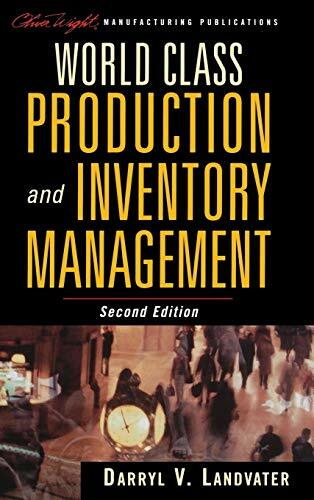 I would recommend this to anyone new to operations management in a production environment. The book does a good job of covering the key concepts of inventory management and production planning in a quick and easy to read format. I read this book as part of a Masters degree, comparing actual methods with "The Proven Path". It is the only humorous book I have read on methodologies and the concepts are of relevance to all systems implementation - not just manufacturing. I thought the book was easy to read and very interesting - in short, it is excellent. A must for those pursuing a production career. The book does not go into great detail but it is worth reading because it explains everything you need to understand how a manufactoring company has to work in order to achieve full controll over its business processes. The examples are very simple but very usefull. 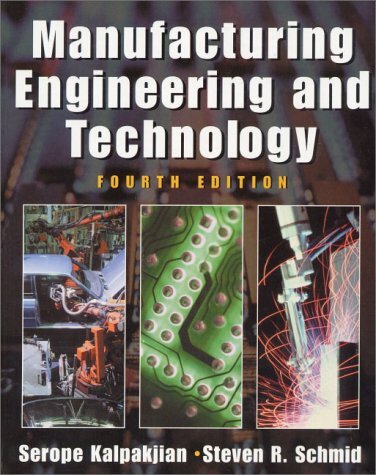 It is also a good book for people that do not have a background in manufacturing because it explains everything you need in order to understand the main subjects. A tremendous book for tomorrow's leaders, today! An Excellent Tool for all!! This book has helped in all areas of our business. We are incorporating it into all of our processes!! Wonderful training tool for any organization. This book gave me great insight to re-initialized our lean efforts. We have been so busy and got caught up in the value stream mapping craze and kaizen events, but little impact. This book did a superb job in laying out the eight steps, with all the forms, templates necessary to ensure sustainable results. Great work by the authors! There are a considerable number of very useful tools contained in this book that we used immediately. This book allowed us to put in a process of lean implementation, simple in nature, and very effective. Great basic, easy to follow plan for implementing lean. Takes us far beyond just the mapping craze. Highly recommended for small and large organizations. A quick introduction on how to use Lean Six Sigma to improve your workplace, meet your goals, and better serve your customers. Lean Six Sigma combines the two most important improvement trends of our time: making work better (using Six Sigma) and making work faster (using Lean principles).In this plain-English guide, you’ll discover how this remarkable quality improvement method can give you the tools to identify and eliminate waste and quality problems in your own work area. You’ll see the big picture of what your company hopes to gain with Lean Six Sigma, how it may affect your work area, and what it can mean to you personally. Publisher: J. Ross Publishing, Inc. I have been looking long and hard for a simple, step-by-step guide to implementing Lean methodologies in my facility and I have finally found it. Most of the Lean books I've seen up to this point discuss high-level concepts, without detailing the steps and tools needed to put the strategy into practice. However, this book (more of a "how-to" manual, really) outlines all the tasks needed to move from a traditional batch manufacturing system to a Lean environment. It covers everything from project scoping to line design to Kanban materials movement systems. Not only that, the author provides all the tools (formulas, charts, project management tips, etc.) to guide you through the process. He's also provided methods, like the daily resource planning tool, that help you manage the line after the Lean processes are up and running. I'm using the guide now for my line reconfiguration, and have gotten it for everyone on my implementation team. This book is good for any manufacturer that is planning to implement Lean, but doesn't have a plan for how to go about it. Finally! A Pragmatic Approach to Lean Manufacturing! 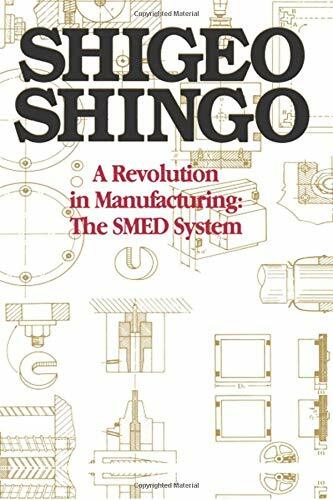 This is the first book that I have read on Lean Manufacturing that was not a reflection of the author's ego masquerading behind a plethora of platitudes and hedonism. Mr. Hobbs uses a lexicon of terms and applications anybody can understand, making this not only a useful implementation tool, but also a dynamic resource and training tool. 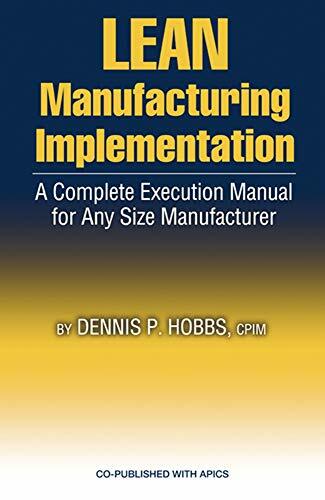 As proof, we assembled an implementation team of personnel from all areas of our factory, and were successful in converting two of our product lines in less than twelve weeks simply by following Mr. Hobbs' book. We plan on completing the other seven by the end of Q2. If you want to reap the rewards and benefits as a Lean Manufacturer, I highly recommend this book! the book is very good ..no doubt but the service is aweful. 2. had to wait for 3 weeks to get the book. my advice would be to avoid abebooks.com through amazon if possible because the same book is listed for $ 33 on their own website and here they sell it for $ 41 ...so waste ur money if u want. As the developer of the QI Macros SPC Software for Excel, customers often call with exotic questions about statistical methods for quality control. Montgomery's book, more often than not, is the one I turn to for answers that I can't seem to find anywhere else. Even if I do find the answer in another book, it's always easier to understand in Montgomery's. The book is written in a way that makes seemingly incomprehensible statistics understandable. And there are plenty of examples. If you're looking for a book to help you implement quality control in a small business, Montgomery's book is a bit too much, so you might consider my book on the Small Business Guerrilla Guide to Six Sigma or Six Sigma Simplified. 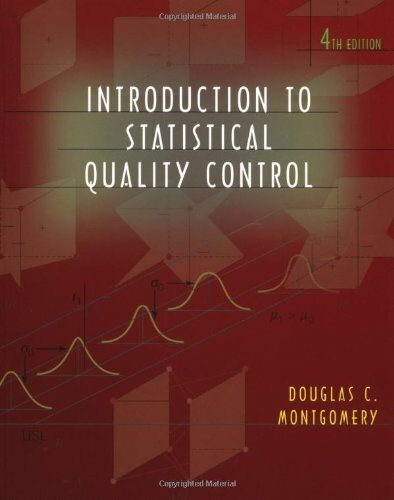 The book gives an overview of the importance of quality management, the basics of statistics (variability, distributions, etc. ), different methods of statistical process control, the use of control charts, capability analysis, design of experiments, process optimization, and sampling. I found all of the chapters informational and practical. Montgomery does a great job of presenting the theory, giving examples, and helping the reader understand the big picture of various concepts. For example, Montgomery states that a "Pareto chart does not automatically identify the most important defects, but rather only those that occur most frequently," and then gives an example illustrating when this can be so. This is something that might have been overlooked if not pointed out to the reader. While to book is rather current in introductory theory and practice, there are some relics from previous editions. For example, the inclusion of a random number table in the appendix is rather useless, since all modern calculators and spreadsheets have random number functions. This minor complaint aside, the book is solid and worth having. This is a rather comprehensive book on SQC. It benefits from a good introductory treatment of Design of Experiments, a subject sorely missing from most SQC texts. The arrangement of topics in the book is logical from both pedagogical and practical points of view, and the author's stress on improvement -- rather than control -- is the right one for the readers. 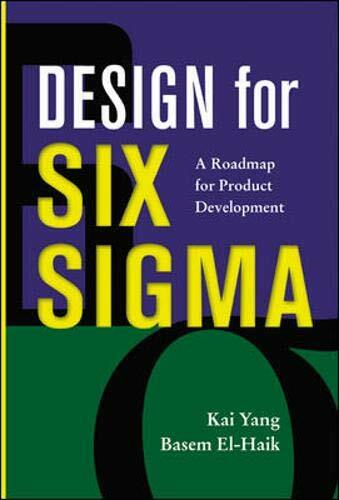 'Design for Six Sigma: Roadmap to Excellent' is a great book for learning and practicing quality engineering principals in product development. This book mainly focuses on how to apply the most popular and the latest quality engineering techniques to a products design cycle. Actually I used the coursepack version of this book in my quality engineering class in the last term. This book is very easy to understand and includes a lot of real world examples. After reviewing basic theories and going through these on-hand industrial case analyses, I could apply these powerful tools to solve my own project problems immediately. Since this book coves DOE, Taguchi Robust Design, Tolerance Design, RSM and many other subjects, I am using this book as my handbook. This book is not only a great textbook for engineering students who are learning product design, but also an excellent reference book for engineers who work on product design at a daily base. I have read several books about DFSS before this book and find the concepts in most books are not clearly defined. Most DFSS books do not cover the newly promoted design theories such as TRIZ and Axiomatic Design, which are ASQ Six Sigma Black Belt Certification Body of Knowledge required. Yang¡¯s book is the best resource I have found so far for engineers like me in understanding and implementing DFSS in new product development. I especially like the topics of TRIZ, Axiomatic Design, tolerance design and Taguchi parameter design presented in the book. Before this book, I had worked very hard to figure out these theories, but still not clear where are directions and benefits. This book uses very simply descriptions and examples or cases to make some ambiguous concepts very clear. Taking TRIZ chapter for example, the authors made a link between TRIZ theory and the function analysis concepts in Value Engineering and cleared some fuzzy concepts. I highly recommend this book for all engineers who want to implement Six Sigma in the product development because it not only offers the a road map for ¡°do the right thing¡±, but also provides hand on techniques to help you ¡°do right things all the time¡± in product development. This book is a very valuable resource for Six Sigma Black Belts or Black Belt candidates because DFSS will play more and more important roles in Six Sigma practice. I have not found such a comprehensive book for design of six sigma. I started using this book for advanced experimental design and taguchi methods, but ended understanding the complete roadmap for design of six sigma. The systems approach allows an enthusiast reader to start anywhere, without having to spend time refering back to earlier chapters. The relatively newer trends as TRIZ and axiomatic design have also been nicely dealt with. Overall, this is a very nice and easy read book, with excellent and well defined examples. A must for everyone who wants a quick refresher on the design principles of six sigma. This is an outstanding DFSS book for production development. It contains integrated information and some of which you could hardly find anywhere else, thus with one book in hand, you have all the tools to get to your destination. This is also a easy to read book providing the reader with a solid understanding- Concepts are clearly defined, real world examples/ case studies are fully described and the chapters are well organized. It can serve as a textbook for students/beginners and also can serve as a handbook for experienced engineers. The title says it all- this is a roadmap for you to find the way correctly and easily. I am reading the book right now, and the book is really beneficial to me. How can you apply value stream mapping and lean concepts to the more complex environment created by mixed model (high variety) manufacturing operations? 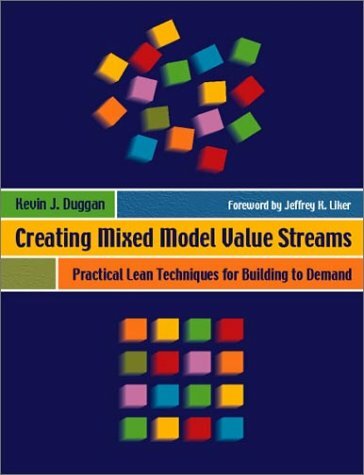 CREATING MIXED MODEL VALUE STREAMS helps to address the challenges of high-mix manufacturing. The author uses a step-by-step approach, illustrated through a case study based actual experience, to go beyond the basics of value stream mapping and to show how to create future states in the real manufacturing world of multiple products, varying cycle times, and changing demand. The book includes a CD-ROM featuring useful spreadsheets for sorting products into families and calculating equipment needs. A 5S initiative offers a cost-effective approach to enhancing safety, quality, and the work environment. It provides clear and measurable bottom-line results. This system can be especially useful in companies with ISO and QS-9000 initiatives. I found that this book was packed full of common sense, which is rare in a development management book. Although it has a lot of examples of manufacturing of phsyical goods, I found it great as a software manager. There aren't many spare words in this book, either -- it's terse and well edited, so you get the raw facts and the necessary stories to back them up, but not a lot (or any, really) fluff. I am putting it on my bookshelf for software engineers, right next to Writing Solid Code and Debugging the Development Process, two classics for software engineers and team leads, respectively. Absolutely the best book there is on the subject of new product development. Of particular import is the discussion on market and pricing dynamics, which may be new to technical-types. Choosing the right product to develop is critical to avoid "The Innovators Dilemma". The book however needs to add more to the discussion of the importance (and risk) of rapid return of (partial) information to the team during the development cycle, as well as human (team) dynamics. I would therefore recommend "The Team Handbook" as a necessary adjunct. While the first edition was a bit dry to read in the first four chapters, the second edition is more fun. The value of the content has not been reduced with rev 2.0, on the contrary. The book is full of sound business theory which is well explained and put into real life context to help the non-MBA to transfer the message to their respective challenges. Also invaluable are the hints towards common pitfalls. They show that the authors have really applied the theory and are aware of the human factor in change processes. I read rev 1.0 and 2.0 and will probably buy 3.0 as well. Over 14 years of software experience confirmed alot of what this book offered. It's well written, chalked full of great facts and gives you a perspective on the possibilities for software development. Let's face-it, software development has almost zero manufacturing issues. So, if your looking for the real reason to implement processes and methodolgies into your development processes, this book will take you there. 1) Make the decision to develop a new product idea quickly. 3) Specify it simply and quickly and do not change the spec (3 days, 3 pages). 4) Spend a little time on the product architecture, designing for modularity and quick development. 6) Make a successful transition to manufacturing to complete the project. Effective forecasting, planning, and scheduling is fundamental to productivityand ERP is a fundamental way to achieve it. Properly implementing ERP will give you a competitive advantage and help you run your business more effectively, efficiently, and responsively. This guide is structured to support all the people involved in ERP implementationfrom the CEO and others in the executive suite to the people doing the detailed implementation work in sales, marketing, manufacturing, purchasing, logistics, finance, and elsewhere. If you're exploring an enterprise-wide solution, even if it isn't an ERP package, or are planning an implementation after the software has already been selected this book will prove invaluable. Unlike other books about ERP (and e-business and enterprise application integration for that matter), this one is focused on the business processes and what it takes to prepare for and manage the implementation. 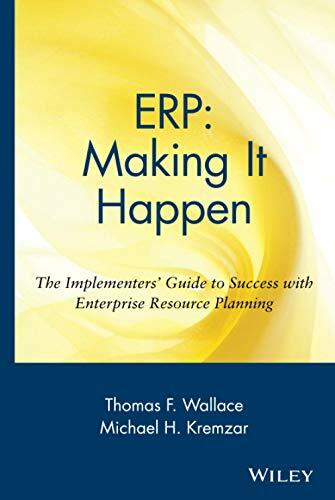 Of course, while much of this book applies at a high level to any enterprise application, it is all about ERP. The authors take great pains to avoid talking about software, which in itself is refreshing. They also skillfully guide you through a panorama of key issues, including what ERP is and how it fits into the overall scheme of business value and competitiveness. However, the best part of this book is their implementation strategy, which explores how an ERP package is going to require changes at the business process level, how to break down the implementation into manageable stages. In this respect the book is a combination of a management overview of ERP, organizational change strategies, and project management approach to implementation. The key areas addressed by this book reflect reality. For example, all of the major challenges that you're likely to face are addressed. The critical success factors, such as training, preparing the organization for the system (from a people perspective), and the way the implementation phases are sequenced can either be learned from this book, or learned the hard way (which is sure to include schedule and cost overruns at best and a disaster at worst). In particular, the process-oriented approach that is reiterated throughout the book needs to be heeded. This is the essence of any ERP package, and it will change your organization. This book gives good advice on how to effect the shift from discrete jobs and procedures to a workflow. Much of the U.S. economy is now based on services rather than manufacturing. 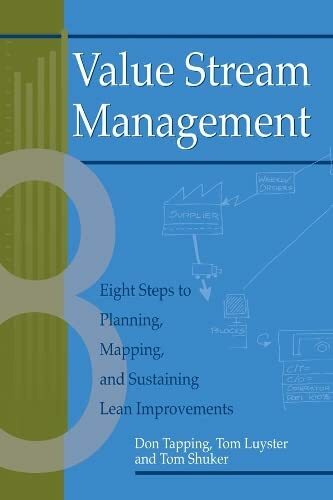 Yet the majority of books on Six Sigma and Lean--today's major quality improvement initiatives--explain only how to implement these techniques in a manufacturing environment. Lean Six Sigma for Services fills the need for a service-based approach, explaining how companies of all types can cost-effectively translate manufacturing-oriented Lean Six Sigma tools into the service delivery process. A customer is the King ! If there is Quality product, the customer satisfaction ratio level rises up. Customer chooses its high-end needs and service follows. This is the point when this Book comes in too informative to fill in service based approach. With the case studies, the book provides the Executives to go for a solution to satisfy a customer not only with quality but with the service to boost up the sales thereby with cost cutting factors and provide transactions quick and easier with added services and yet not adding the staff. The delivery process can be made much effective with the cost cuts with the clear examples and like other Six Sigma in Business, this one is sure pick for all Manufacturing unit Executives who also believe in Quality Service. Good Read. I admire Michael George for coming up with another innovative solution by applying the Lean Six Sigma approach to Service Industry. 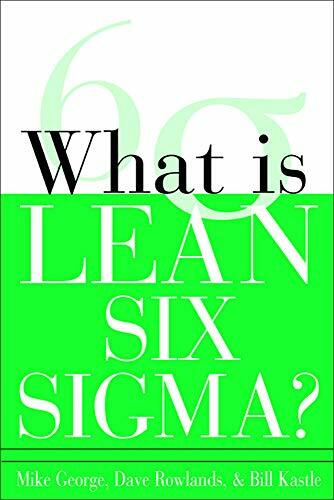 As Lean Six Sigma has helped companies in the manufacturing industry, this book will help the Service industry. "Lockheed Martin is driving operating excellence in all work that we do. We recognized that our business support processes have as much opportunity for improvement as our design and build areas. By applying Lean process speed and Six Sigma quality tools to all elements of work, such as marketing, legal, contract administration, procurement, etc., we can drive competitive advantage. 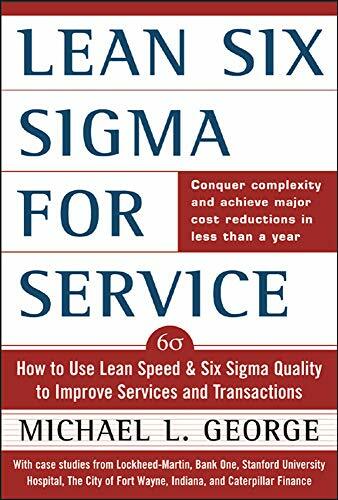 The lessons learned and practical case studies contained in Lean Six Sigma for Service provide a template which can create great value for customers, employees and shareholders." Let me say that the book is okay, nothing wrong with the book. But here is my question: What is the purpose of the book, the exact purpose?? I work around tools and shops so when I see a book for $110. I think it must have something new. It does not, and it is at a level where it does not really have enough information to help. It is sort of am overview with pictures and some drawings. Coffee table book on machines - so to speak. I would recommend forgetting about this book and buy some regular shop manuals or shop guides from a tool supplier. There are a number of one and two volume sets that give a lot more useful information, and very detailed information. Maybe this is for high school students, but not for professional shops. Sorry but that is my humle opinion. I have the book and it collects dust. My recommendation: check out MACHINERY'S HANDBOOK also on amazon.com. A quarter century after MRP first transformed the global manufacturing arena, Next Generation Product Development stands poised to similarly impact new product development. This movement-defining book gives R&D professionals an in-depth explanation of the ways in which companies are able to achieve substantially higher levels of development productivity, while better aligning product development with strategy through new practices and systems. 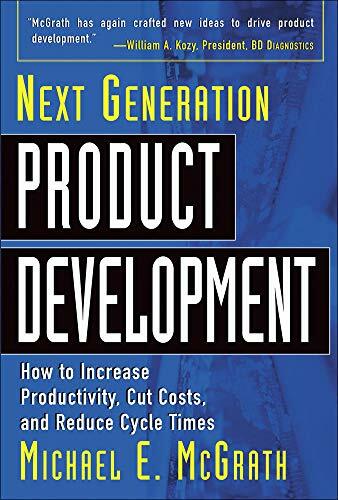 The last paragraph of Michael E. McGrath's newest book "Next Generation Product Development" boldly states that "product development has never been for the faint of heart." And I suspect that most everyone who has ever been involved in such activities will quickly shake their head "yes" to this "truth" statement, and quietly wish there was a better way. Fortunately in his new book McGrath guides us to this better way--a way that offers "more opportunity and promise for getting better new products to market faster, WHILE DOING MORE WITH LESS." The claim is nothing short of a renaissance of product development capability. I like this book a lot. I like the multi-faceted emphasis on integration. I like the productivity theme and the need for new management processes. And I like the idea that we are only beginning the renaissance of product development capability, especially given the growth of collaborative development. I confess that I do not like the continued use of the DCM abbreviation (it stands for "development chain management.)" But I suppose I can learn to live with another "alphabet name" because it does get to the heart of the matter--how to manage a lot of INTERDEPENDENT projects, all of which are going on at the same time. Of particular importance are McGrath's thoughts involving a "networked team," new concepts which I think will be fundamental to tomorrow's successful product development. To join this renaissance, exactly where does one begin? McGrath offers three entry points: changes in resource management, changes in project management, or changes in strategy management. I suppose someone will try all three at once, but frankly just one is probably a lot for an organization to swallow. For different entry points McGrath offers us guidance, with levels of maturity assessments and/or stages of implementation. But even still, there is a lot of material to assimilate and multiple readings of many book sections will be needed to fully comprehend his recommendations. However I suggest that you don't spend an excessive amount of time studying. Organizations mainly learn by doing, and this book lays out the "learn by doing" path toward success. Past generations of development have emphasized invention, project management, or time-to-market. This next generation is a path toward productivity within the entire development enterprise. It is a path toward "better decision making, better investment in R&D, better return on that investment, more collaboration with external partners, and true empowerment of development activity." I suggest that you buy the book and begin. Michael McGrath has done it again. He has articulated a clear and compelling description of the next major generation in product development - the R&D Productivity Generation. The new generation builds on the major accomplishments of the last generation, which McGrath calls the Time-to-Market Generation. Whereas the TTM Generation primarily focused on getting individual products to market as quickly as possible, the R&D Productivity Generation will focus on the most effective and productive use of a company's total R&D capability (both internal and extended enterprise) to drive overall corporate revenue, profit and market share. During the TTM Generation from 1992 to 2000, benchmarking studies determined that the R&D Effectiveness Index (the ratio of new product profit to R&D investment needed to create new products) doubled from 0.5 to about 1.0 across all industries. Over the next ten years, McGrath forecasts that the R&D EI will double again to 2.0 driven by the processes and systems of the R&D Productivity Generation. The message is clear. Companies that lead the way in implementing the R&D Productivity Generation will gain significant competitive advantage in the market place. Through out the book, McGrath illustrates the new processes and systems using an example company, Commercial Robotics, Inc. CRI is a hypothetical company, but represents the kind of advances that are now being made at many different corporations. The example gives compelling evidence for the benefits that accrue to a company that systematically implements the new R&D Productivity Generation. 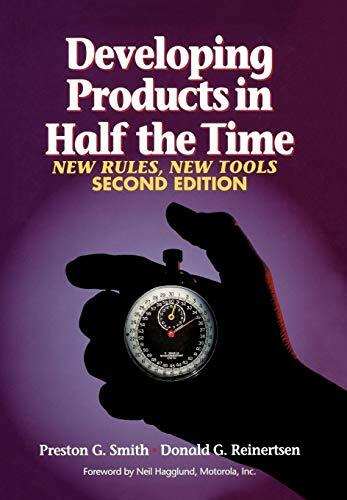 This book does an excellent job of explaining how manufacturing setup times can be drastically reduced, including many useful examples. Reducing setup times is critical in the effort to implement the extraordinarily efficient Toyota Production System. The text is much clearer than "Kaizen For Quick Changeover" by Sekine and Arai. This book deals with setup time reductions for loosely toleranced components or assemblies, and does not deal specifically with tightly toleranced parts.